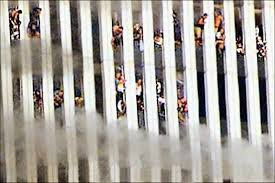 Fourteen years ago today, September 11, 2001, the United States of America suffered a horrendous, coordinated attack by Islamic extremists that took nearly 3,000 lives at three separate venues. That date produced tragedy and heroism - and a lifetime of grief for those with loved ones who were killed in those cowardly attacks. Those innocent people who died that morning, and the brave first responders who went into the bowels of the World Trade Center Towers and the Pentagon looking for survivors, will remain in my heart forever. On this anniversary of that date I want to specifically remember two of the victims - the youngest and one of the most heroic. Today Christine Hanson, who died along with her parents when they were vaporized when their airplane crashed into the World Trade Center, would have been sixteen years old. 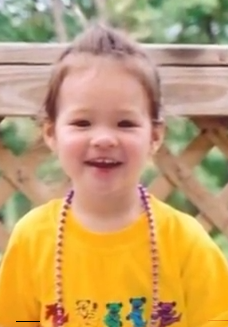 She would have been a junior in high school, perhaps on the cheer squad or a star on the soccer team. Or, perhaps, she would have been a budding musician or actress. Or, she might have been an outstanding student. Or, perhaps she would have fallen in love by now. We will never know, because that young life was snuffed out. 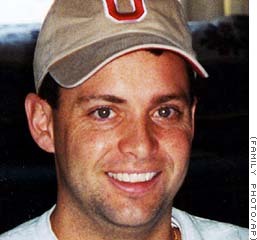 Todd Beamer was a 32 year old software salesman, father of two sons and a daughter that would be born in January, 2002, just a few months after 9/11/01. She is 13 years old today. Beamer and other passengers attacked the hijackers of Flight 93, keeping it from attacking the apparent target in Washington, D.C. The plane crashed in a field outside Shanksville, Pennsylvania. I've written about this attack for several years on or around this date. Here are links to what I've written in the past. Tomorrow, Friday, September 11, 2015 the City of Costa Mesa will hold a remembrance of the tragic events that occurred on that date fourteen years ago. Here is the full text of the City announcement. This Friday, Costa Mesa Fire and Police Departments will join with city employees and residents to hold an official remembrance ceremony. Each year, Costa Mesa and other fire and law enforcement agencies throughout the region (and the country) gather to honor and pay a special tribute to the members of the uniformed services who perished (343 members of FDNY, 23 members of NYPD, and 37 members of the Port Authority Police) and all of the innocent victims who perished (2,574). The Costa Mesa Fire and Police Departments will hold ceremonies at City Hall and at all of the city’s fire stations. The gathering area at City Hall will be adjacent to the flagpole from 8:30-9:05 a.m. on Friday. 8:40 a.m. - Brief opening comments – Fire Chief Dan Stefano and Police Chief Rob Sharpnack. 8:46 a.m. - Representing the time the first plane struck the WTC Tower #1; all fire apparatus will be pulled out on the front apron of the fire stations and all radios will be turned on in apparatus. 8:55 a.m. - Everyone will gather near the flagpole for a moment of silence. 9:00 a.m. - Uniformed personnel will be at attention and the regional emergency communications center will make a countywide broadcast acknowledging Patriot Day - A Day of Remembrance. 9:05 a.m. - End of official remembrance ceremony. It seems somehow very appropriate on good old Throw Back Thursday to write about Costa Mesa's most notorious "throw back", our old buddy, The Mouth From Mesa North. For most of the past dozen years he and I would spar. In fact, there was a time when the editors of the Daily Pilot would post our respective commentaries adjacent to each other, just for fun. Well, it was fun for me, anyhow. The Mouth and I don't spar much any more. His bilge doesn't appear much in the Daily Pilot and I've cut back on my contributions there, too. Instead, we both post on our individual blogs - he for his audience and me for mine. There's not much overlap, except I KNOW he reads my stuff and I check in on his, too. Of course, when I do, I have to visit places like the Wall Street Journal, where REAL writers hang out, to flush his intellectual excrement out of my skull. Every once in awhile - much to the chagrin of my sweet and patient wife - I will write about The Mouth, just to see if he's paying attention. I know he reads my stuff - probably eager to learn, since the hits on his blog have dropped of to such an extent that it doesn't even register on sites that measure such things. 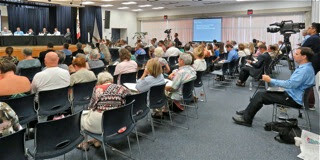 Such was the case when I posted a nice little observation that he briefly attended the recent Joint Study Session, learned everything he needed to know in the first 30 minutes of the meeting, then left to write a blog entry castigating the dozens of residents who actually attended and participated in the process. Well, The Mouth didn't much like the publicity, so he dragged what's left of his scruffy old carcass to his computer and pounded out a nasty-gram about me, which you can read HERE. 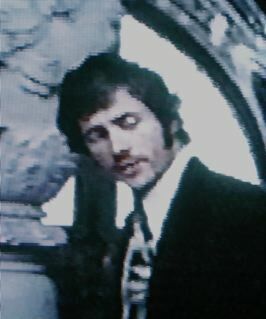 In that little diatribe, speaking of himself he wrote, in part, "....sinewy muscles that are still reminiscent of my time in the Marines, and in the photo you can see my ubermensch looking skull holding the mammoth brain that got me a seat on a genius TV show and my membership in Mensa and the so-called super Mensa." Well, here's the image to which he refers. Yep, "sinewy" alright. When I first saw him that night I thought perhaps a homeless person was seeking refuge from the heat, for goodness sake! For those of you new to this game, I invite you to visit this repository of his racist, inflammatory bilge and just scroll down and select a title - almost any title - click on it and read the work product of his "mammoth brain". If you actually believe his claims to Mensa membership, you may come away from reading some of those essays with a feeling of sadness that such an alleged prodigious intellect has been wasted - squandered - on such crap. 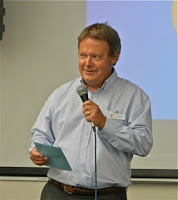 Old Mensa Marty - a term of endearment that former Daily Pilot Publisher Tom Johnson used for him - has wasted his life. He claims to have been an actor, and to have been the inspiration for Robert Deniro's performance in "Taxi Driver". Now, THAT'S a scary thought all by itself! I know that he has been in one movie - perhaps the worst movie of all time, "The Second Coming Of Suzanne", where he plays a reporter very briefly. I actually paid $1.26 to Amazon for a copy of this thing a couple years ago. Watching his performance, it's easy to see why his acting career when nowhere. If you're into self-abuse, watch the 19 minute clip of a review of this movie. The reviewer actually gets it right. If you look VERY closely, and very quickly, at the 12:44 mark you'll get a look at him with too much back light. Actually, that's the best way to see him. He has also claimed to have been a lawyer and real estate agent, but who knows. What we do know is that he takes great pride in the fact that David Duke, the former grand pooba of the Ku Klux Klan, considers him a wonderful writer. The Mouth uses that as a marketing tool. Let me ask you... would THAT endorsement drive you to Amazon to buy The Mouth's books? Nah, I didn't think so. The Mouth didn't much participate on Social Media sites (using that term when applied to him seems so very wrong!) 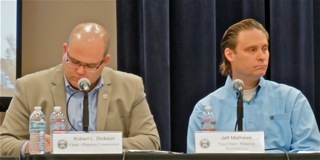 until the evolution - if you can call it that - of the Costa Mesa Public Square Facebook page. That site, with it's closed society, has given his putrefied views of the world a new, unsuspecting audience. He's become a major thought-driver on a site where folks just ramble on, agreeing with themselves with no actual discussion of important issues permitted. If you disagree, or post something they don't like - even if it's on another site - you will be bounced. No, sir.. no dissent permitted. The Mouth - with his Nazi tendencies - is in hog heaven over there. And, it's interesting that The Mouth has chosen NOT to participate on other OPEN Facebook sites, including the threads on the Daily Pilot. Nope, for all his bravado and bluster - flexing his Marine background - he's not going to participate in a real exchange of ideas. For all his "Mensa" flag waving, he's actually a coward - afraid to engage in real discussions with us lesser beings. How very sad for him - but good for us. So, I encourage you to learn about this insidious influence on our community before you jump on his bandwagon. Read a few of those essays - go back to the early ones for some REAL shockers - then decide if you want to cozy up to him. 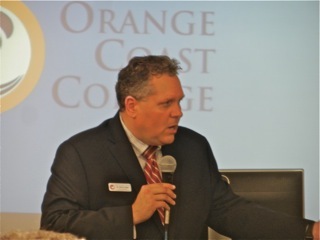 Wednesday evening officials from Orange Coast College unveiled their scaled-back "modernization" plans to a standing-room-only room full of residents and students in the library building on campus. 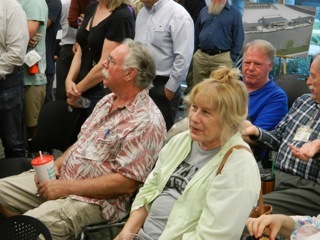 My best guess is that about 50 people attended the meeting - fewer than previous meetings and, interestingly, not a single City of Costa Mesa senior staffer was present. Doug Bennett, Executive Director of College Advancement for OCC explained the format of the meeting, then introduced Dr. Dennis Harkins, President of OCC. Dr. Harkins spoke very briefly about the new plan - he made a point to be sure we understood that this was a brand new plan, with a new Environmental Impact Report. He also made sure we understood this was a "modernization plan", NOT a "growth plan", since OCC presently is well below the high point of enrollment a few decades ago. 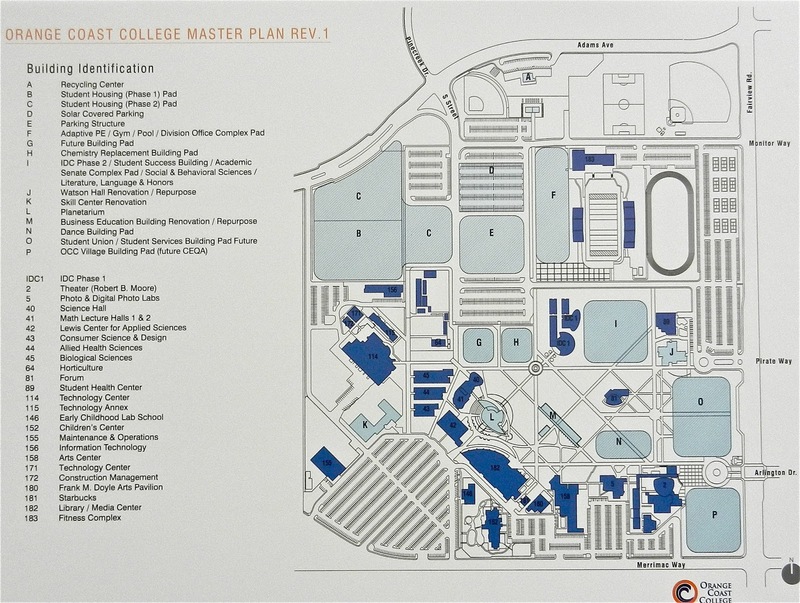 This plan presumes a student population of 28,000 by 2020. 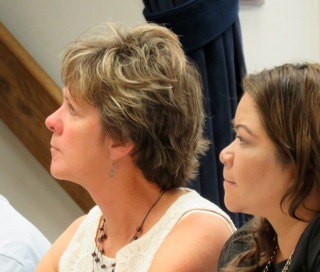 Issues being presented at this meeting were Traffic, Student Housing and Health issues. 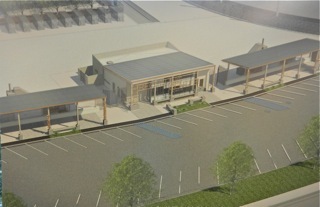 The parking structure - that would have accommodated 2,000 cars - has been moved on-campus. There is no funding for it yet - Dr. Harkins told it is several years off. The gymnasium will be relocated closer to the football field. There will be some solar panels covering part of the parking lot. The Recycle Center will be enhanced, with more parking available. 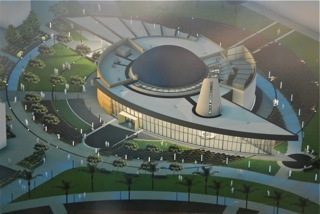 The Planetarium is ready to be built. The controversial College Village - which had included a hotel - is on hold and will require a separate CEQA report. Some of the historic buildings will be retained, including some of them by renowned architect Richard Neutra. However, some of those will be removed. Rich Pagel, Vice President of Administrative Services, expanded on the current plans and told the audience that there will be tables around the perimeter of the room at which experts in each of the fields being discussed that night were available to answer all questions. However, there would be NO public comments before the group - a "recorder" was available to take questions/comments to become part of the permanent record of the meeting. With that announcement the audience was unleashed to wander around, talking to experts. However, not everyone was happy about that. 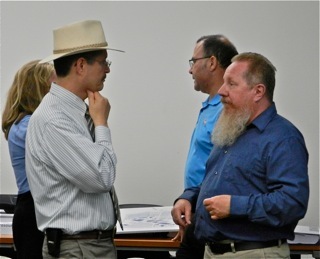 A local architect named John Linnert sprung to his feet with an associate, whipped out a chart showing an alternative plan and hijacked the meeting - at least, in part. He held court for nearly an hour - he was still going on and on and on when I left - preaching to an amorphous, but attentive group of mostly students. There was no attempt to stop him, which seemed like the right decision. So, the information provided at this meeting will be consolidated and become part of the report and will impact how the college will move forward with this project. Most of the things that caused nearby neighbors heartburn - the hotel and parking structure, for example - have been put on hold. Progress is being made. OCC's Environmental Sustainability Coordinator, Mike Carey, explains his new Recycling Center to an interested visitor. If you wish to read the full documents, the brief overview (11 pages) can be found HERE. 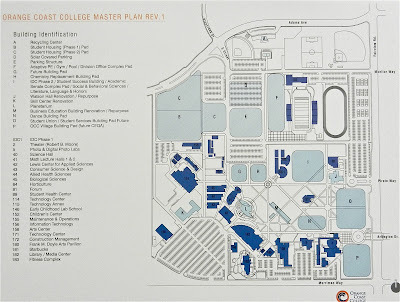 The Full Revised Master Plan (550 pages) can be found HERE. And, for you diehards, the full technical information (4,754 pages) can be found HERE. Late Night Study Session "Fun"
(1) The Proposed Land Use Alternative For the Year 2015-2025 General Plan Update, Including the Fairview Developmental Center and the Los Angeles Times site on Sunflower. Read that lengthy staff report HERE. (2) The Proposed Urban Plan Amendment to Amend the SOBECA and Westside Urban Plans, HERE. Under normal circumstances a study session will take a couple hours, but this was anything but normal. This one took nearly five (5) hours! And, when it finally finished, you felt yourself wondering exactly what had been accomplished, because for much of the evening it seemed like the discussions were going in circles. Although Councilwoman Katrina Foley and Planning Commissioner Tim Sesler arrived late, the only real absentee is pub owner Gary Monahan. He never did show up, but had apparently met with Development Services Director Gary Armstrong and left some of his thoughts behind. The audience was a blend of anxious groups - developers, fearful of changes to the General Plan that would hamper their projects; building industry and chamber of commerce representatives; activists concerned about the lack of affordable housing and bicycle infrastructure and just plain old everyday residents concerned about how the changes in the General Plan will affect them, personally. I'm not sure any of them came away from this meeting feeling all warm and cozy. 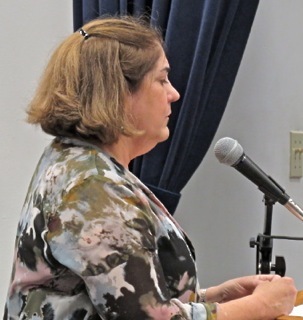 Laura Stetson, Principal of MIG Consulting, took the lead on the General Plan discussion, providing an overview of the process - which, at this point, has taken a couple years. She quickly led the discussion on the history of the process and gave us an idea of the schedule we're following. She tossed the ball to Darrell Surface of Stantec Consulting, who explained the traffic survey they had done. 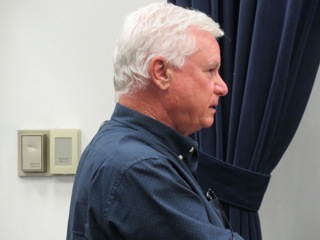 Then economic consultant Roger Dale provided a fiscal overview of the probable impact of the General Plan as proposed based on certain assumptions. Leonard Glickman representing Rose Equities, a firm who wants to develop a chunk of land next to SoCo north of the I-405, introduced himself and his company. 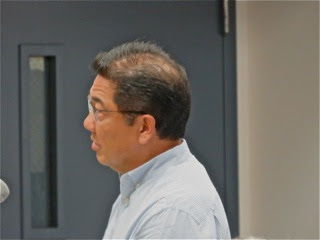 George Sakioka, landowner and developer of property above the 405, urged a long-term view. 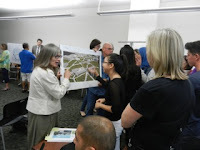 Kathy Esfahani, representing the Costa Mesa Affordable Housing Coalition stressed the need for affordable housing, transitional housing, playing fields and suggested the Fairview Developmental Center property would be a great place to begin that kind of development. 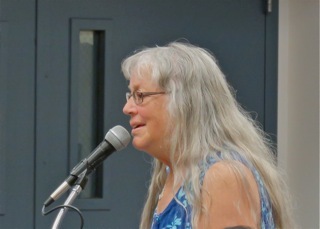 Robin Leffler, President of Costa Mesans For Responsible Government and long time activist, expressed concern for what she perceived as a quickened pace for the completion of the General Plan and hoped it would not be released over the year-end holidays, when folks are preoccupied with family issues. Jeff Knightly (sp? ), a representative of Kearny Real Estate, is working with the Tribune Companies on the potential development of the old Los Angeles Times printing press site north of the 405. Former planning commissioner Eleanor Egan complimented the staff for their excellent work, then skimmed through parts of her nearly 3-page letter to the council/commission that was part of the staff report. She was concerned about traffic, and indicated that simply collecting park fees is not enough and told the group to not add uses that sell alcohol - we have enough of those. 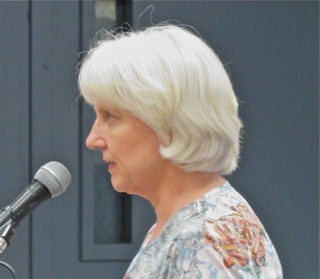 Former councilwoman Wendy Leece observed that we have no Vision, and also complained that many people had left their homelife to participate in the consultant's "Great Reach" program, but no evidence of community participation is evident in the staff report. She was not the only person who made that observation. 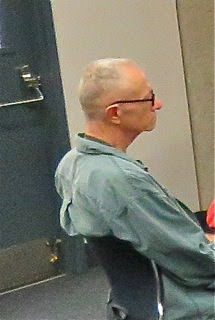 Long time resident, Gay Royer, pleaded the case to use the Fairview Developmental Center property as housing, preferably for veterans and low income folks. 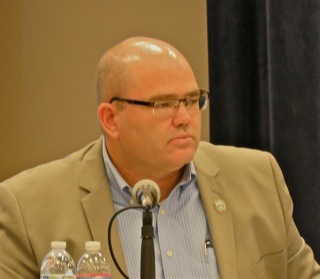 Former councilman Jay Humphrey expressed concern about the several mobile home parks around the city, which form one of the last bastions of affordable housing. 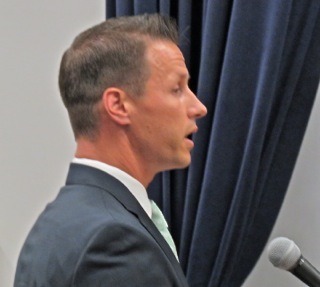 Justin McCusker, representing the Segerstrom interests, suggested consistency in application of trip counts. Cynthia McDonald, a member of the Bikeways and Walkability Committee, observed that no mention of bikeability is made in the plan. She suggested any developments include bicycle transportation as part of their equation. Long time Westside property owner and businessman John Hawley urged fairness in developing parks and other recreation venues. 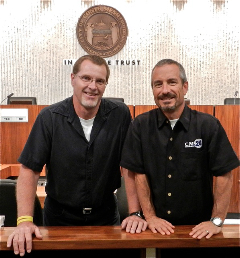 Mike Balsamo, representing the Building Industry Association (BIA) made mention of Costa Mesa's "restrictive" parking rules and encouraged the council/commission to be reasonable. Then the Big Dog took over. 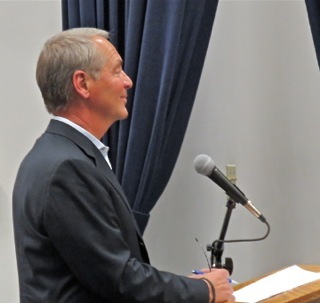 Mayor Pro Tem Righeimer leaped right into the midst of this issue and used the next fifteen minutes to deliver a monologue about what HE wanted to see - and delivered that message less as a request and more as an edict. I mean, he's apparently never had an idea that wasn't a perfect idea... don't get me started! NO RESIDENTIAL NORTH OF 405! 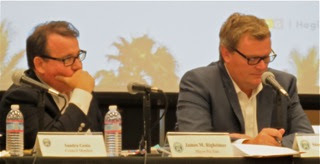 He began by alienating most of the developers in the room by stating categorically that he didn't want residential north of the 405, west of South Coast Plaza. He then spit back at Leece for her "no vision" comment, citing that we're only talking about 4% of the land in Costa Mesa, so we don't need a vision for that. 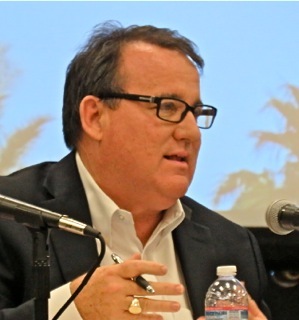 He addressed the Segerstrom's Home Ranch property, indicating that the Segerstrom Family would like to see a major employer establish a home campus on the property. He said we should not give the LA Times property more density than the Home Ranch property. 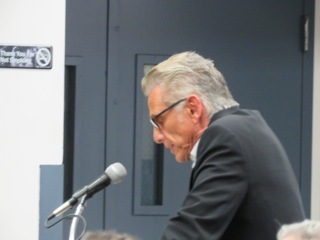 He addressed the Robinson Pharma property - Glickman's project - and said "no residential" there. 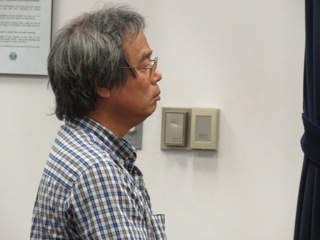 He spoke about the Sakioka property and said their plan was way too dense, and it should be capped. His words were "That's what I wanna see!" Oh, but he wasn't finished. Addressing the Fairview Developmental Center, he said it's a "once in a lifetime opportunity" that we shouldn't miss. He said there should be "no institutional business type play. ", whatever the heck that means. He said 25% should be a park, then said "It's only 100 acres", indicating that it's not really a big deal. What?! He just said it's a once in a lifetime opportunity! He wanted more information from the economic consultant - more data. Then he blurted out that he wanted this to come forward for a vote at the next council meeting so we can "move it forward". Well, that's impossible! The next council meeting is in 6 days. Councilwoman Sandra Genis took the floor and, also, asked for more information from the economic consultant. 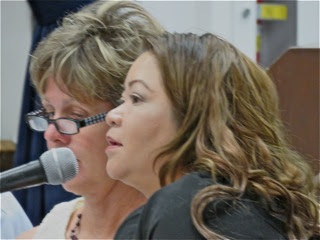 She was concerned that the General Plan includes over 60% high density housing, and that we need transitional housing. She expressed concern that our plans will be perceived to be exclusionary. She was concerned that the forecast predicts 20,000 more people near-term and that means we need 85 more acres of park land - not likely in a built-out city. Katrina Foley said she was OK with residential development north of the 405, but needed more information from the traffic study. She said she was interested in the plans for the LA Times and Robinson Pharma sites. 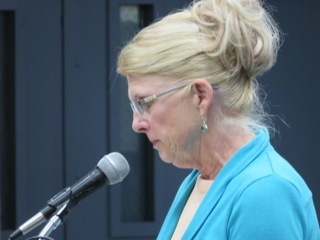 She was concerned about the "canyon effect" of putting high density housing along Harbor Boulevard, and expressed concern also about Santa Ana's recent decision to permit high density housing along their section of Harbor Boulevard, which would directly impact Costa Mesa. She expressed concern about density around SoBeCA, and the traffic backlog. She also is not supportive of housing along Newport Boulevard - too close to the freeway. Foley was also very concerned about the compressed timeline and the impact it has on the work being done by her Bikeway and Walkability Committee. She asked for clarification from staff about the timeline and how that committee's work will be finished in time to be included in the General Plan. 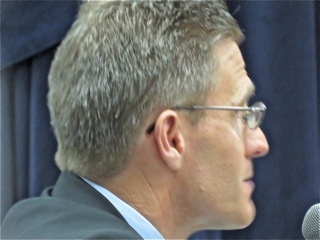 Armstrong indicated that the timeline was dictated by the council. Foley didn't remember voting on it, so she wanted to know WHO on the council gave that direction... No answer. 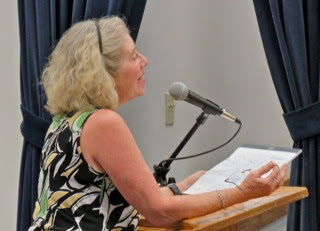 Righeimer jumped back in, accusing Foley of being "disingenuous" about housing along Newport Boulevard, and accused her of preferring "pimps, prostitutes and drug dealers" on that stretch of roadway instead of nice, new high-end housing. He then ranted about not forcing property owners to make changes and I almost choked. I wonder what he calls the code enforcement, police and fire visits and the impact of his "Excessive Use Of Resources" Ordinance that forces property owners to make a choice - public safety or pay a fine. What a hypocrite! Foley indicated that, in her mind, it's not an "all or nothing" proposition. Compromise is possible. She observed that Righeimer was politicizing this conversation. 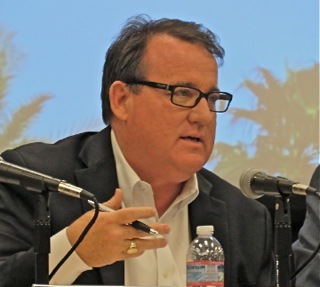 Mensinger said he supported housing north of the 405 and observed that we need to find a carrot for the State to make future plans for Fairview Developmental Center more agreeable. Righeimer, again, inserted himself into the discussion, observing that since 1999 nothing has changed, to which Foley responded that there are 3 people up here (or would be if Monahan showed up) and that the decision only go for developers. We were now just short of three hours into the agenda and only half-way to the end, so we took a break. When we reconvened just after 8 p.m., the crowd had thinned out significantly. There were around 60 people in the room and more wandered out as the evening progressed. Assistant Director of Development Services Claire Flynn took the lead on the presentation of the next agenda item, the proposed urban plan amendment for the Westside Overlay Plans and the SoBECA plan. She described the three different plans and went through a list of recently completed or in process projects. Without talking about all of them, the prices begin in the low $700,000s and go to the mid $800,000s - hardly "affordable" or even entry level housing. She told us that "unlikely" buyers for those properties would be seniors, families with teenage children. She said "likely" buyers would include first time buyers, dual income professionals, move-up buyers, entrepreneurs with home based businesses, executive professionals that telecommute and above average wage earners - twice the average wage. All the discussion guides are available in the staff report, above. During the discussion Genis expressed concern about mobile home parks, a source of rare affordable housing. Righeimer responded that "Level 1 had a mobile home park." Well, that certainly didn't make her feel any better, since those prison-like units start at over $700,000. 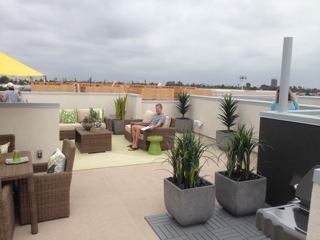 The discussion of "open space", which included rooftop decks, bounced all around. Foley wanted more space on the perimeter of projects. Flynn observed that there's a tendency to mix and match elements of one urban plan with others - kind of a cafeteria approach to development (my phrase), which was certainly NOT the intent of those residents who worked very hard on the Westside plans. Interest has been expressed in further refining the size of the "work" space in live/work units. Presently the work space can be no less than 250 square feet. It was suggested that it be made 500 square feet.. a concept that got not much support. The predominent concern was for those rooms being used as a bedroom, and that many of the units in those developments are being rented via AirBNB. After 20 minutes of discussion Mensinger opened up Public Comments and 22 people spoke. Gay Royer said the present development doesn't fit. Jim Kerins wondered whatever happened to design guidelines. Linda Tang, representing the Kennedy Commission and the Costa Mesa Affordable Housing Coalition, expressed concern that there are no affordable housing units available for vets. 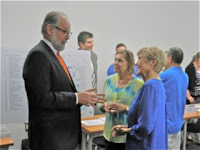 Developer Peter Zehnder suggested gathering architects in a forum to present to staff, council and commissoners the most contemporary design trends. He also observed that Costa Mesa has difficult parking standards - that's developer-speak for "What, you actually expect me to properly park my project?" Susan Iwamoto observed that she and other property owners have been quietly trying to find ways to combine their properties to make them more attractive to developers. 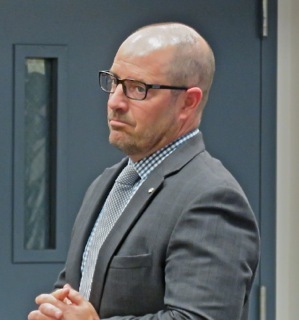 Brent Stoll, Chamber of Commerce appointee to the Bikeway and Walkability Committee (and member of the Rose Equities team), expressed the need for better bikeway planning, and for more destinations for bike riders. Kathy Esfahani again expressed concern about low-income folks being priced out of the city. All the development is aimed at high-end earners. She suggested adoption of an inclusionary ordinance, requiring a percentage of all development to be affordable. Wendy Leece observed that the Sea House project - one that Flynn had mentioned earlier - was near her home and it just doesn't fit into the neighborhood. Eleanor Egan again spoke and observed that Amendment #1 to the Urban Plans has resulted in the current mess and that it should be repealed. She said cherry picking standards from various plans is not planning at all. Taoward Lee observed that the open space, as presently calculated, is a joke. Leonard Glickman - he of the Rose Equities group - spoke again about the wisdom of mixed use developments, which provide jobs and affordable housing. 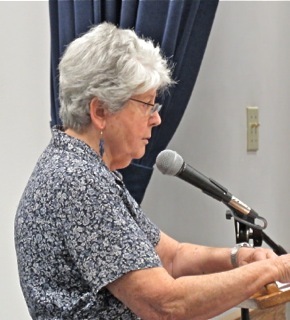 Ann Parker expressed concern about the influx of AirBNB units in the city. 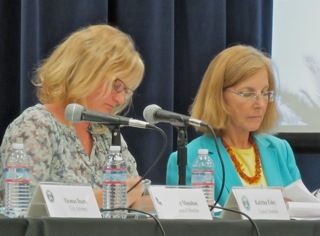 Cynthia McDonald indicated that the city is 10-15 years behind in bike infrastructure and changes need to be made soon. 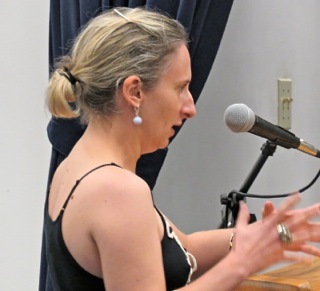 Anna Vrska opined that development has bent toward profit - more appropriately, greed. At this point we were not four hours into the meeting and the "crowd" had dwindled to fewer than 50 people. Righeimer launched again, having regained his breath, stating "Everybody wants what's best for the community." (I'm sorry, but I smirked.) Addressing the Westside he said, "It didn't have 20 yards of concrete poured in 20 years." 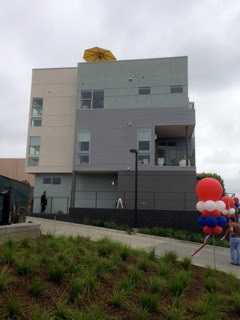 Yep, you Westsiders are such low-lifes that you can't build nice new houses like the mayor and himself (so we're told). 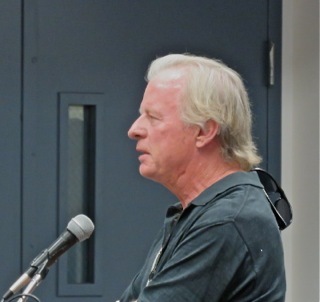 Addressing the suggested 500 square foot work space, he said it would kill the Ametek project. Genis said she didn't like the box houses and questioned the wisdom of using any part of the rooftop decks as "open space" in the calculations. 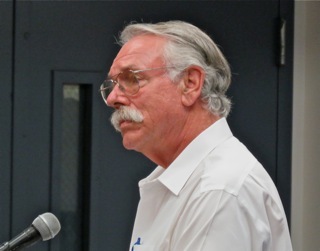 Foley expressed an interest in pocket parks to provide some much-needed open space. Mensinger said he was fine with including a portion of rooftop decks in the open space calculation - suggesting half of it. Foley disagreed. 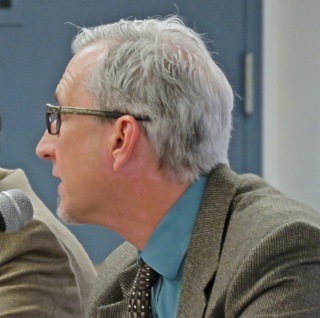 PLANNING COMMISSION TO JUDGE COLOR PALETTE? 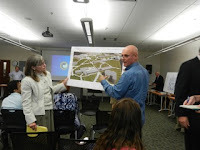 Then the conversation turned to the "look" of some of the projects, with comments being made that the color scheme that had been presented to the Planning Commission is NOT what was actually applied to the project. Righeimer observed about the Superior Point project, across from Trader Joe's on 17th Street, indicating it was "too white". I smiled. He forgets those pastel pimples on the roof. He then suggested that the Planning Commission gets final approval of the colors! OMG! The world has gone mad! We're going to put four lawyers and a paralegal in charge of the "look" of a project - men with no architectural training? That's maybe the stupidest comment - in a long, long line of stupid statements - that he's ever made! That generated one doozy of a conversation, with Genis telling us that if she wanted to live in a city where the government tells you what color you can paint your house she would have moved to Irvine! Dickson said they just wanted to be sure what had been presented to them is what ended up on the project. Good grief! Colin McCarthy, who had been absolutely mute until this point, expressed the need for guidance on the 250/500 square feet on the work space, citing multiple uses in the units. Dickson said we are already requiring ADA compliant bathrooms on the first floor. Round and round the conversation went, with big concerns about the work space use. Dickson said the Homeowner's Association would be responsible for policing the use... really? "Knock, knock. Hi, I'm Fred from your HOA, here to check your ground floor room to make sure you're not misusing it. Wow, nice big screen TV! Do you have the NFL package? Nice pool table! No trouble getting it in that roll up door, huh? Hey, that's a snazzy bar you set up on that back wall! So, what's the business use here? Ah, Indoor Recreation Consultant! Great! Sorry to bother you. See ya around the grounds." 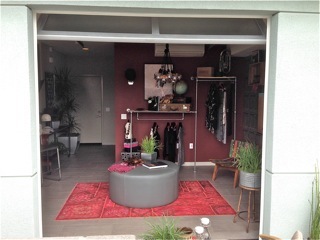 The conversation also included concerns about using the garage for actual car parking. 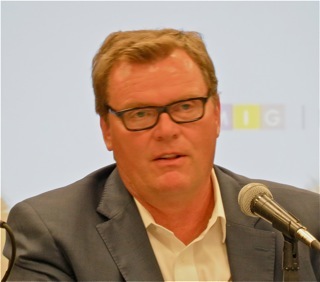 Dickson also observed that the targeted buyer for those units is not looking for a city park. Really? The meeting ended at 9:45 - a new record for a study session. By my count, there were 18 city staff members in the room until the bitter end, and that didn't count whatever staff of the Community Center were left to close the place down. In case you really want to see and hear these discussion, Dane Bora and Brad Long, along with a full team from CMTV, were on the job last night. It will take them a couple days to blend the various camera shots and produce their final product, but it likely will be available for viewing on CMTV and on the streaming video on demand at the city website. Almost forgot.. the cadervous creature, The Mouth From Mesa North, slithered into the meeting just before it began, took a seat closest to the exit, stayed a few minutes, then skulked away and didn't return. However, he promptly posted a blog entry criticizing those who actually came to contribute to the process. His drivel is going straight down hill... perhaps a sign of early onset dementia or some other malady typical of a man of his years.